More often now, virtual 3D models are seen embellished with data sources being developed through the design process no matter what sector of the built environment. These ‘digital twins’ are just in their infancy at the design stage and the intention is that they mature through the construction process and into the operational life of the ‘asset’ to test and analyse its use and performance. The ultimate aim is that a digital twin continuously learns and updates itself from multiple sources to represent its near real-time status, working condition or position. So how do we check that what is physically constructed reflects the ‘as designed’ digital twin? “In order to fully appreciate what’s available to us now, let’s consider for a moment, the traditional way of verifying what is actually constructed versus what has been designed,” said Vito Marone, chief platform owner, BuildIT, while talking about the state-of-the-art construction verification techniques. In most cases today, even when in possession of an up-to-date building information modelling (BIM)-authored model, the checking of physical construction against that model is rarely as thorough as it should be, he added. Often, an approach along the lines of ‘this is the way we used to do it’ is carried over to checking against 2D drawings extracted from a model. Hence, we have a range of solutions from ‘Surveyors on site taking key measurements upon completion and marking up drawings’ through to ‘Surveyors on site measuring at key stages of construction and producing/updating digital drawings for comparison’, Marone explained. It’s fair to say that although methods such as these have seen buildings completed and functioning today through 2D documentation techniques it’s not necessarily going to take us confidently into the new digital age. The advent of BIM processes creating data-rich virtual models of buildings, roads, rail lines and waterways with links to specification, cost and time data sources is enabling a construction business environment much more akin to that of the automotive or product manufacture businesses, he said. It follows, therefore, that clients are beginning to use the valuable data for ongoing business operations rather than simply procuring a ‘building that their business takes place in’. Indeed, it’s sometimes now a requirement for construction teams to demonstrate that what was designed and signed-off, has been built in the real world and performs the way it has been designed to. Similarly, we as vehicle or electronics buyers for instance won’t stand for products delivered that don’t match the stated or designed performance – so why should building owners do so, questioned Marone. 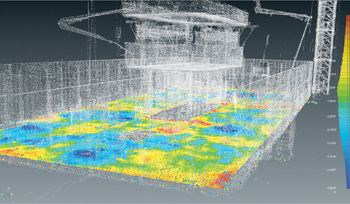 As an example of industry shifting, it’s this very fact, alongside often quoted figures that there is generally a 30 to 40 per cent energy performance gap between as designed and as constructed buildings, that lead the UK Government to include the need for construction verification via point cloud or LiDAR techniques in their BIM process known as BIM Level 2 (PAS1192-2:2013 Section 10.2). So how does the modern construction company deal with these digital requests for verification? “Whilst this is a state-of-the-art process and a big shift in the construction industry, what we’re doing here is bringing 20 to 30 years of our experience from the manufacturing industry to construction,” Marone said. 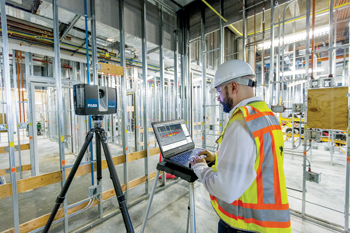 With the process of ‘laser scanning’, FARO’s BuildIT software provides the ability to compare that measured survey with a 3D model or indeed another scan or analyse the scan itself, he said. “Once you’ve pointed the software to the design model and the measured survey and/or the input device the results are quickly displayed in the most appropriate way you choose. 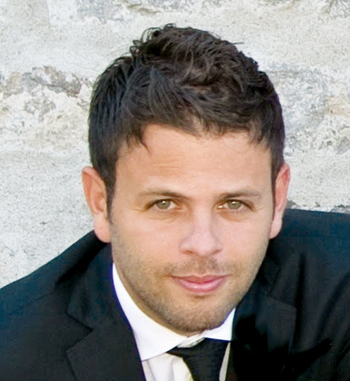 With the standard features of version one, the return on investment (ROI) is through the roof,” said Marone. In a nutshell, technological advances now allow construction companies to verify much more precisely and quickly using easily captured digital representations of the real world against designed and modelled building works. “It’s not a static process either… the software can be used in ‘real time’, feeding in measured data, analysing it and then, using a ‘tracer’, project a pattern on the surface where areas are out of tolerance,” he said. “Construction verification is a fundamentally important part of the new era of our digitally enabled environment. It’s the process of developing and updating the digital twin, which is helping to drive huge inefficiencies out of our industry and enabling us to create more technically complex solutions for our modern world,” he added.